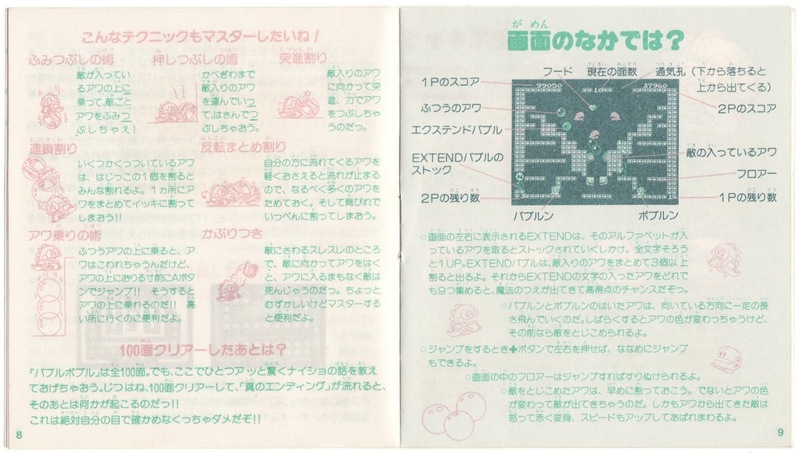 As promised in my last post about the packaging produced for the "Disk Writer" version of Bubble Bobble's Famicom Disk System port, here is that Japanese release's instruction manual. 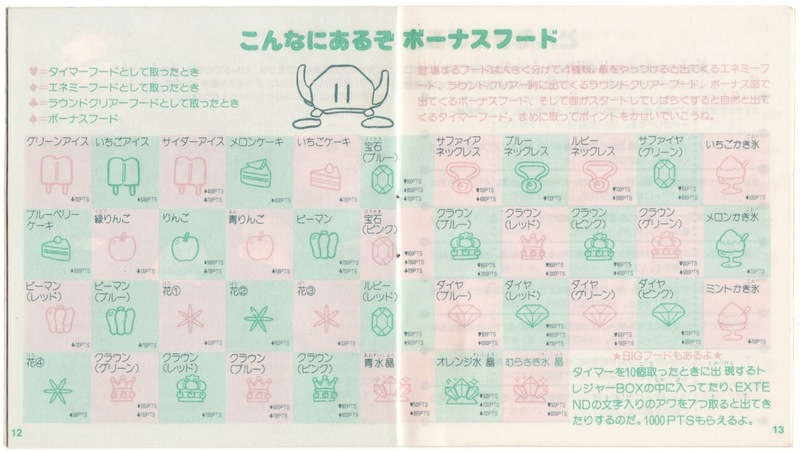 Something I've got to say right off the bat is that I'm sorry if the scans offered up here seem overly pale. 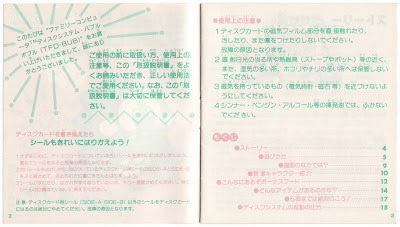 The fact is, they pretty accurately depict the real-world product. 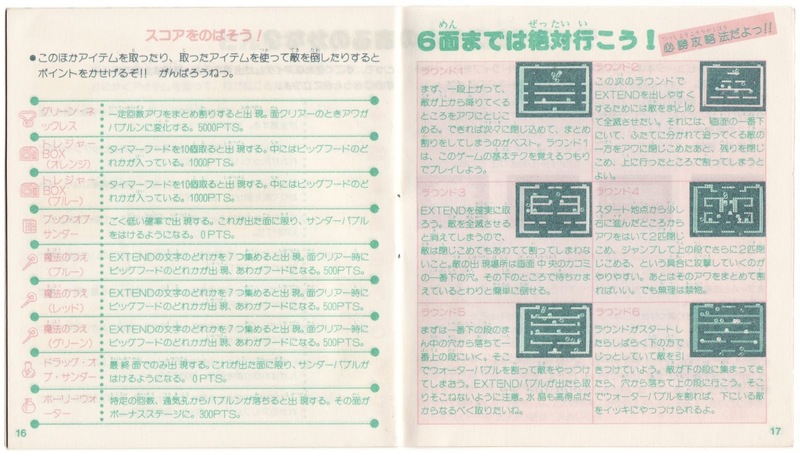 Thankfully, they look a lot better when you click on them and blow them up a bit, so I'd highly recommend doing just that as you work your way through this write-up. 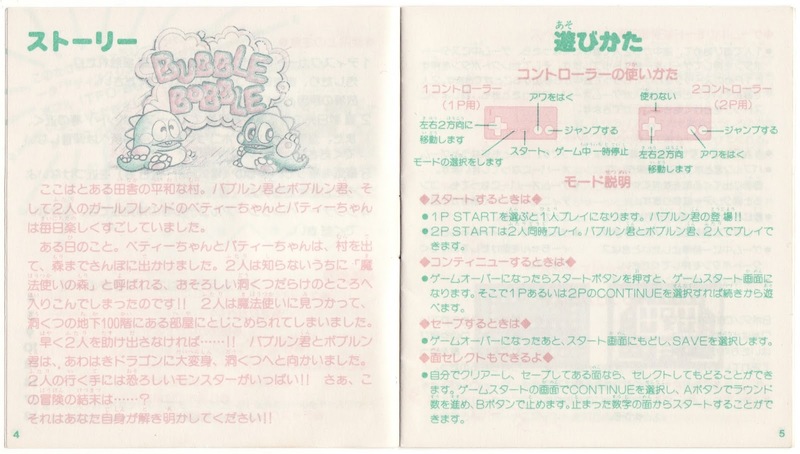 Anyway, the first real page of Bubble Bobble's Famicom Disk Writer booklet (below) shares the game's rather simplistic story--rescue Bub's and Bob's girlfriends from the "Cave of Monsters"--complete with an abundance of exclamation points. 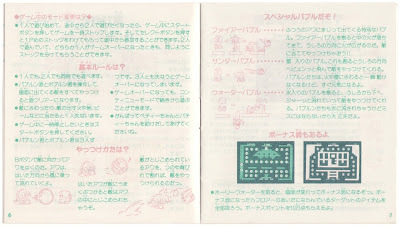 The next page, as you probably can make out, explains Bubble Bobble's wonderfully straightforward controls. 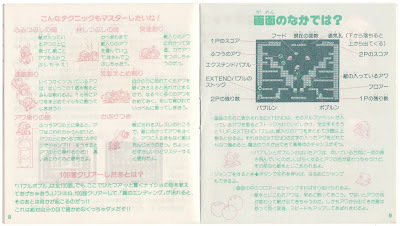 The couple of pages that follow (see above and below) attempt to expand that education by sharing a few more advanced strategies that can be employed while playing this classic single-screen platformer. 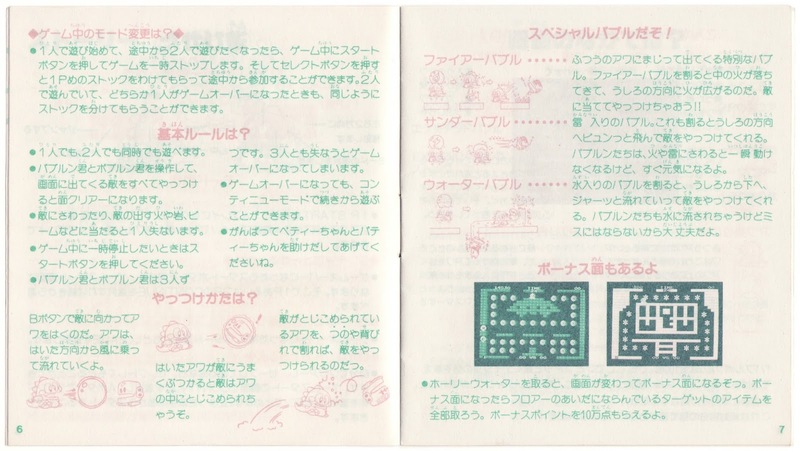 It isn't until the 10th and 11th pages of Bubble Bobble's Famicom Disk Writer manual that we get to the really good stuff. 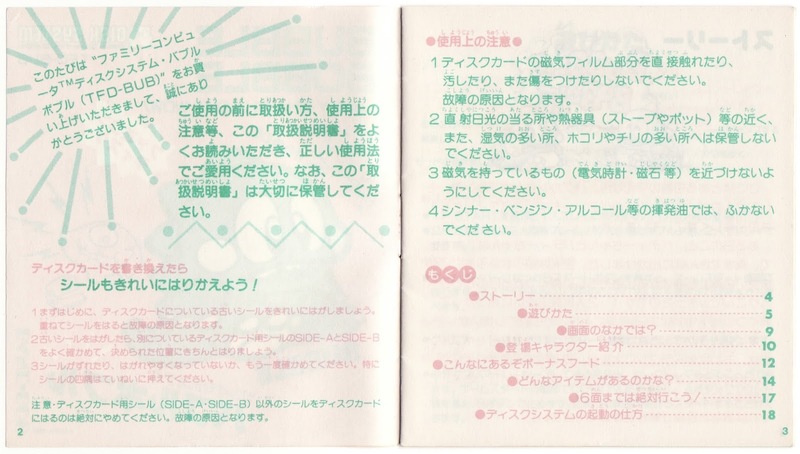 In this case, that means bios of the game's protagonists (the aforementioned Bub and Bob, or Bubblun and Bobblun in Japan) and chief antagonists. 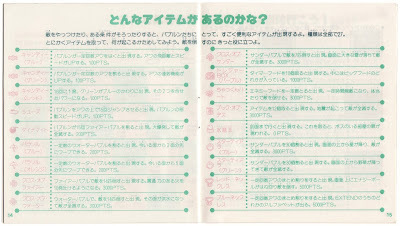 Next, we have a pair of pages that are filled with illustrations of Bubble Bobble's many "point items." 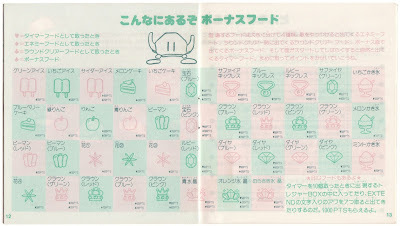 After that comes a spread that focuses on the game's power-ups and rare items. 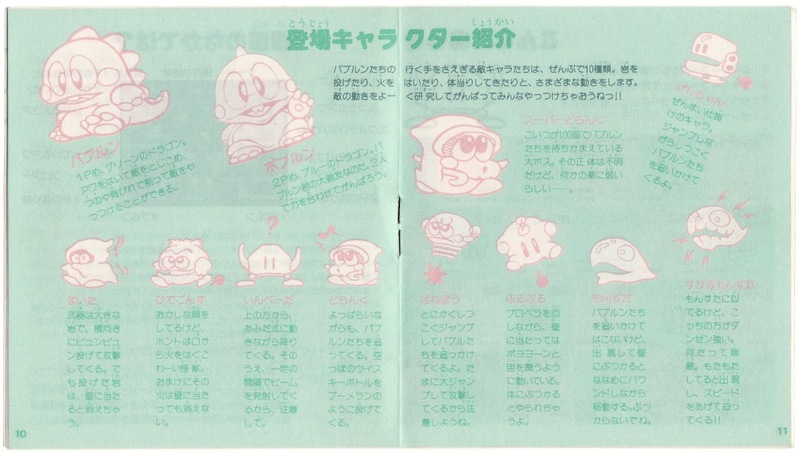 The right-hand page, below, gives players a brief glimpse of Bubble Bobble's first six stages--and likely offers up a few relevant words of wisdom as well, I would imagine. 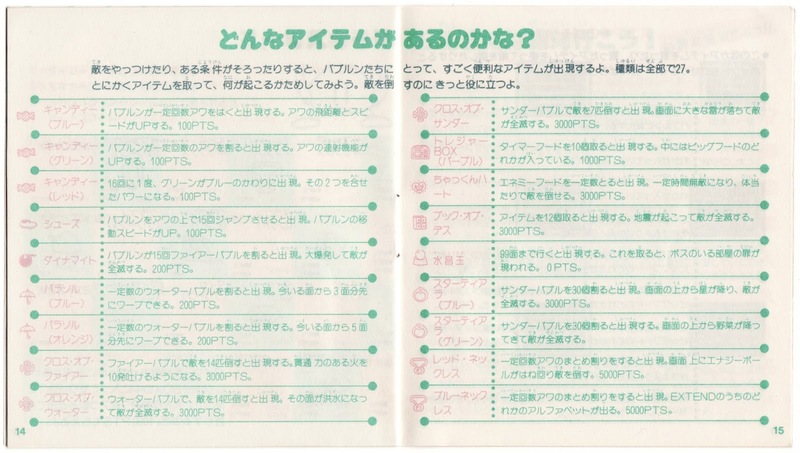 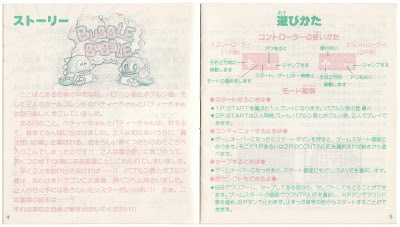 Finally, developer and publisher Taito spends the last characters of the Bubble Bobble Famicom Disk Writer instruction booklet highlighting and describing the numerous error messages that could pop up as folks attempt to play this version of the game. What do you think? 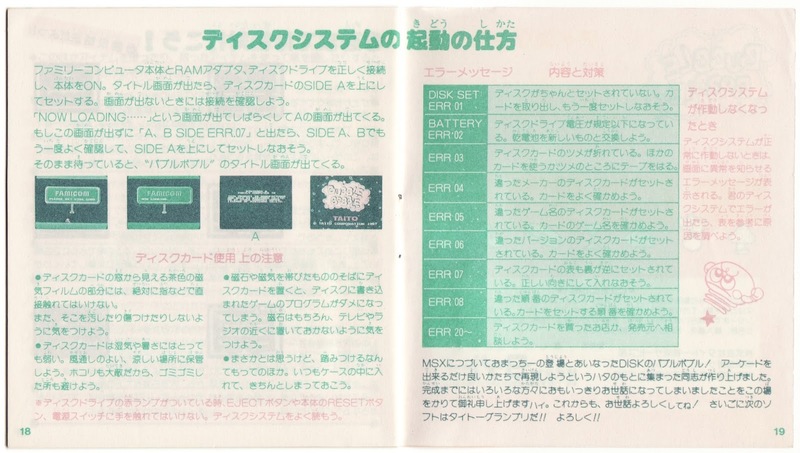 Was it everything you imagined it would be? 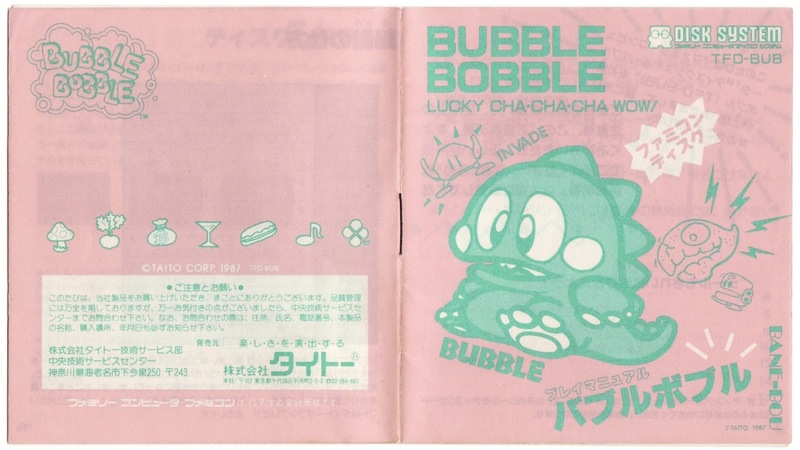 If it isn't, don't fret; in a week or so I'll publish a post that focuses on the impressive manual that shipped with copies of Bubble Bobble's Japanese limited edition. It features similar content to the one showcased here but is quite a bit larger and also is in full color.